- Publisher 1. Management: An Applied Behavioral Sciences Approach. 2. Motivation and Behavior. 3. Motivating. 4. Leadership: An Initial Perspective. 5. Leadership: Situational Approaches. 6. Determining Effectiveness. 7. Diagnosing the Environment. 8. Situational Leadership. 9. Situational Leadership, Perception, and the Impact of Power.10. Situational Leadership: Training and Development.11. The Situational Leader and Constructive Discipline.12. Building Effective Relationships.13. Effective Communication.14. Leading Effective Teams.15. Implementing Situational Leadership: Managing People to Perform.16. Implementing Situational Leadership: Building Commitments.17. Planning and Implementing Change.18. Leadership to Achieve Quality.19. Leadership Strategies for Organizational Transformation.20. The Organizational Cone.21. Synthesizing Management Theory: Integrating Situational Leadership with the Classics.Appendix: Life Cycle Theory of Leadership Revisited.Recommended Supplementary Reading.Index. 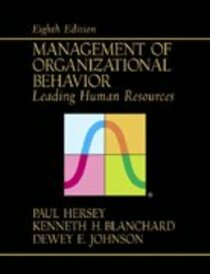 About "Management of Organizational Behavior (8th Edition)"
1. Management: An Applied Behavioral Sciences Approach. 2. Motivation and Behavior. 3. Motivating. 4. Leadership: An Initial Perspective. 5. Leadership: Situational Approaches. 6. Determining Effectiveness. 7. Diagnosing the Environment. 8. Situational Leadership. 9. Situational Leadership, Perception, and the Impact of Power.10. Situational Leadership: Training and Development.11. The Situational Leader and Constructive Discipline.12. Building Effective Relationships.13. Effective Communication.14. Leading Effective Teams.15. Implementing Situational Leadership: Managing People to Perform.16. Implementing Situational Leadership: Building Commitments.17. Planning and Implementing Change.18. Leadership to Achieve Quality.19. Leadership Strategies for Organizational Transformation.20. The Organizational Cone.21. Synthesizing Management Theory: Integrating Situational Leadership with the Classics.Appendix: Life Cycle Theory of Leadership Revisited.Recommended Supplementary Reading.Index.